A broad range of standard and custom solenoid valve manifolds in brass, aluminum, and stainless steel for are Series 20, 30, 50, and 70 OEM solenoid operators are available from Peter Paul Electronics Co., Inc.
Manifolds represent an economical, reliable method for grouping solenoid valves in low profile, compact arrays in applications from beverage dispensing to medical equipment. With less piping and fewer fittings, the use of manifolds allows faster solenoid valve installation with significantly reducing potential for leakage and thread damage. Valve groups are frequently delivered assembled-to-manifold and fully factory tested for leak free operation at specified pressures. Where possible, valve mounting bases are used so that the manifolds may be simply and inexpensively drilled and tapped. 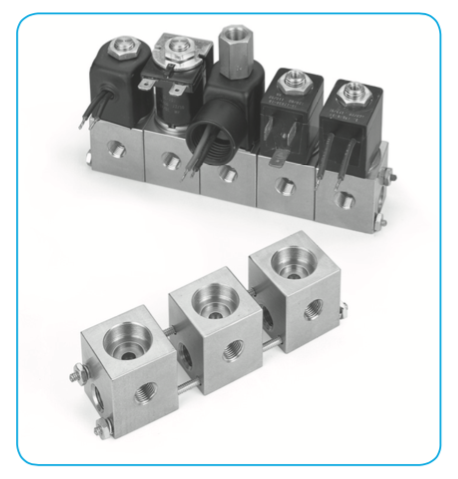 On the other hand, creating custom cavities and seats in stainless steel manifolds blocks is frequently a complex manufacturing solution to applications where valve/manifold height is a primary consolidation. Standard PeterPaul manifolds are offered with 2, 4, 6, and 8 stations, but virtually any linear or over/under manifold configuration can be specified. In addition, PeterPaul provides a life of modular, anodized aluminum or stainless steel stacking valves linked together with common tie rods. 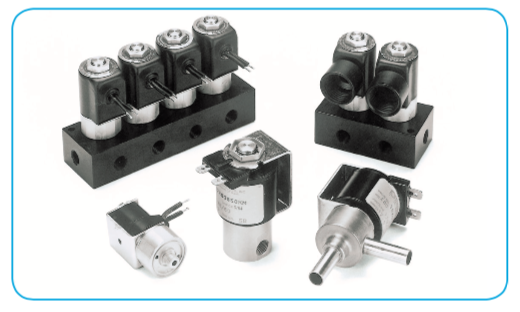 For horizontal or vertical mounting, these stacking valves simplify in-the-field solenoid valve addition or replacement, accommodating housing from any of the standard PeterPaul series. Standard and custom brass, aluminum and stainless steel manifolds and stacking bodies produces by PeterPaul include (clockwise from 6) anodized aluminum modular stacking bodies with a variety of valve housing and common tie rods; anodized aluminum 2-station manifold with Series 50 grommet valves; stainless steel 8-station directional control valve with Series 30 conduit valves; special 2-station aluminum block with Series 30 spade terminal coils; brass 3-station manifold with Series 15 DIN style connectors; brass manifold with 2-way NC series 30 grommet valves; and 6-station anodized aluminum manifold with Series 50 yoke/spade terminal coils. 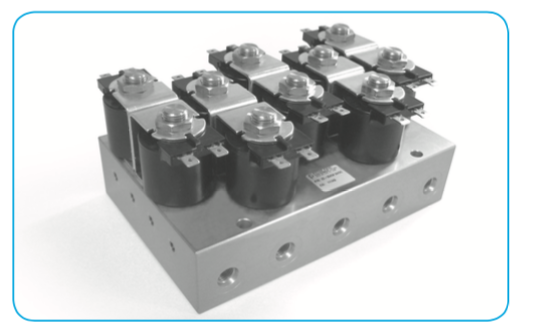 Standard, conventional, one piece machined stainless steel, aluminum, or optional brass manifolds allow the economical, low pro le grouping of valves in compact arrays. These manifolds are perfect for xed, continuous operations. Available with Series 50, 30, 20 and 70 operators. Basic valve and manifolds combinations for the refrigerant recovery/recycle equipment market. Our built in back pressure design eliminates the need for check valves and refrigerant leakage to atmosphere during HVACR system servicing. Our brass, screw-in solenoid valve 1/8” NPT and 1/4” NPT male ports simplify valve to manifold attachment and manifold production. The brass valve bodies help to eliminate leakage and provide required high burst pressure ratings and also make manifolds easier to produce, with one center drill connecting the valves. 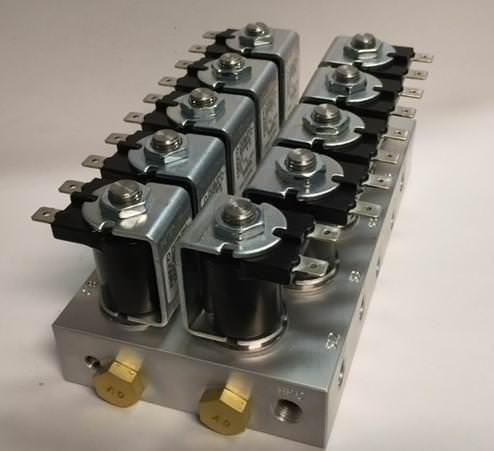 A stacking valve body for Series 15 and 50 are held together with threaded tie rods and consist of passivated 303 stain- less steel or anodized aluminum bodies and is designed for multiple solenoid valves operations and greater ow capacity up to 700% for quicker response times. This building block manifold is used in the emission analyzer and gas processing elds. The modules are 90% machined and drilled from bar stock and can be in a center or end position in the manifold. 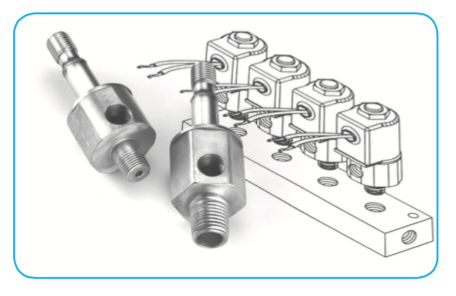 A pre-drilled port connects all modules and the nish drilling of each valves module determines the ow pattern through the manifold. Now individuals can mix and match these vales bodies with minor drilling operations to meet user application requirements.